Lots of strong words focus on unfairness. Equalism promotes the fairness everyone wants. Equalism makes that obvious. …………. There are lots of words and -isms for inequalities of opportunity used by people who want a fairer world. One way or another they all work for greater fairness, equal opportunity and respect for difference and diversity. But there is not a widely used strong word for that shared aim. We need to think through and build up the key principle – equalism – that all have in common. The idea of equalism is not new. A lot of people have got hold of one or two bits of a huge jig-saw. Equalism helps put the jig-saw picture together. Please use, share and talk about equalism. Here’s a definition of equalism: (n) advocacy or support for the principles of fairness, equal opportunity and respect for difference. The French revolution linked three good equalist ideas together into a powerful slogan: Liberté, égalité, fraternité. These are well linked since the rewards of equality are greater liberty for all, and the way to achieve it is through positive support from others. This will be unpacked later. Getting everyone to be exactly the same would not be equalist. As the ‘fair selection’ cartoon illustrates, equalism is about fairness and equality of opportunity with respect for differences. Equalism is not about ensuring equal outcome for everyone in every respect. The cartoon does not imply that someone should take steps to ensure all the animals are assisted (or handicapped) so they all reach the top of the tree in the same amount of time. Neither Marxism nor any other totalitarian ideology imposed by state or organisation, is going to work in an equalist way. The enforcement by a ruling class that makes everyone somehow the same is never going to be fair, provide equal opportunity, nor respect for difference. Here, we focus on more local functioning since – beyond generalisations about free speech, open systems and democracy – we don’t profess to know how to make large or state systems equalist. For more on this important point, see here for 5 mins, and here for 30 mins, of robust analysis of why this equity of outcome for all individuals and identity groups is just not workable. Engineering equity of outcome can be fatally mad – see this example of diversity being promoted over aptitude and skill to the obvious endangerment of lives. Engineering equity of outcome would be as oppressive as any tyranny. It would tie individuals into all kinds of boxes into which they don’t fit and don’t want to fit. Helping victims and fighting for social justice are plainly valid concerns for equalism. But here is a robust 5 mins on how extremes of victimhood culture and of warring for social justice etc are not good for anyone. Equity is the quality of being fair. That includes equal opportunity. Equity does not mean equal outcome. There will always be people who have more power than others. Removing all power cannot be done – someone has to be in power to do it and ideological power is the most tyrannical. What matters when people are face to face as well as for large societal structures is how we work to keep power ethical, to make sure we can deal with power that goes corrupt or unethical. 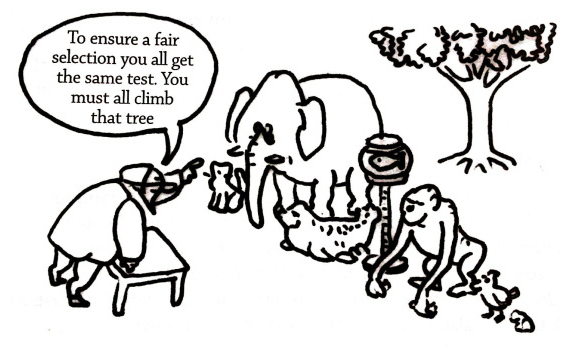 The ‘climb that tree’ cartoon above raises the issue of what a fair test is when people are different. But which of those animals would want to climb the tree (if the man wasn’t ordering them to for some obscure reason of his own)? ‘Respect for difference’ means just that. You don’t make people climb trees when they may not want to or aren’t fit to just to demonstrate the superiority of the monkey. But some tests are fair when you take the wider context into account. If you’re employing someone to harvest fruit by climbing trees to get it, then it would be ridiculous and very bad business not to set tree-climbing as a fair test for that work. This is not a joke. There are now everywhere appointment procedures for skilled jobs – jobs where lack of skill will put service users at risk of their lives eg air traffic controllers – that prioritise other qualities than skill in the job. Positive discrimination and quotas may have a temporary short cut use to demonstrate that all are welcome to the job or the club or the show. But why would you bother to do well in college if that wasn’t the measure of getting a job? And we all want competent shop assistants, teachers and surgeons whether you’re a CEO running a business or a service user in a rush in the shop or with a child needing an education or an operation. It is quite another matter – an equalist matter of equal opportunity – to ensure that all those who can ‘climb the tree’ get the chance to be interviewed, tested and appointed to a job or whatever. Any and all the ways are welcome to ensure no prejudice or bias in the selection of the most able candidate for a job. We organise this blog with the help of the Social GRACES a full list of categories of group identity – the characteristics where differences can go with prejudice and bias. But the fairness of equalism is not achieved through social engineering for equity of outcome by numbers of individuals with different characteristics and group identities. Here are two simple classroom lessons to illustrate inequality and privilege. 1. Unfair advantage in throwing your crumpled paper in the bin. This makes the same point as the fair-test cartoon, but because it is not just a metaphor, it usefully invites more concrete responses and solutions. Do learn from the diverse comments added on that link too – mainly on how far people should help each other or just look after their own good or bad luck; “Fact is a black woman doesn’t have the same chances as a white male, it’s just an observation not your fault” versus “Success isn’t about being lucky, or being ‘privileged’, it’s about working hard and being smart”. Careful equalist thinking about privilege should also be contrasted with the common kind of superficial competitive one-up-person-ship of modern politically correct behaviour. 2. A class of young children easily given a culture of inequality with the usual effects of disrespect and oppression. The story of Jane Elliott, the teacher who created the exercise, is telling too. Her exercise divides brown-eyed from blue-eyed children as an allegory of racism. But the lesson applies to any of the inequalities and the way prejudice and privilege works. Equalism is a simple idea. But thinking it through is complicated. How an individual acts in equalist ways in personal or local situations is different to what cities, nations and the world need to do. And some equalisms conflict with others – e.g. some cultures and religions actively resist gender equalism. Click here for more on equalism in general. Click here for other thinking on equalism compared – and also the list of key features that make this site different. There are many areas of difference between individuals and groups of people. These differences create systems of unequal power, access, social ignorance, discomfort, prejudice, discrimination and conflict. Increasingly around the world social awareness and legislation requires us all to address this better. It is normal though to be unaware of much of this. We may be so familiar with our own local thinking and assumptions that the negative stuff can be unintentional. Read more about keeping a balance of awareness across the spectrum of inequalities. One way to help us become intentionally more aware and fair is an approach and acronym, known as the Social GRACES (Burnham, 2011). It refers to a long list of common areas of unequal difference. The acronym is GGRRAAACCEEESSS. The letters stand for the following (with -isms added): Gender (Sexism), Geography; Race (Racism), Religion; Age (Age-ism), Ability, Appearance; Class, Culture; Ethnicity, Education, Employment; Sexuality, Sexual orientation, Spirituality. The Social GRACES help keep our canvas broad here. It is worth emphasising that equalism requires care and moderation. That happens (or doesn’t) between people face to face. That is perhaps where the finer aspects of human being can best show up. But there would be nothing much to moderate unless there were groups – people whose cause is to take up one side, e.g. the oppressed victim, and then campaign loudly for them against the other side. Group causes take things onto a social and political level – or of course the original tribal one. So equalism can be seen as a (dialectical maybe) process where emphasising differences is a necessary stage that leads to bridging them. This means that, to a degree, equalism values the -isms that it seeks to get rid of. Only when people learn to converse will they begin to be equal. The enemies of conversation are rhetoric, disputation, jargon and private language, or despair at not being listened to and not being understood. Do you think equalism is the best and most uniting word? Lots of good words describe the same sort of thing – fairness, respect, justice, care, consideration etc. Equality or egalitarian (the philosophical word for it) or equal opportunity mean roughly the same as equal, but the words are too ordinary to carry the active purpose here. All these words describe how something is; they don’t convey the pursuit of a principle. Is there another strong enough word that conveys a sense of active advocacy of fairness to match the unfairness words – racism, sexism, age-ism etc? It has to be an -ism, doesn’t it? Alternatives are too clumsy e.g. fairness-ism, respect-ism – while egalitarianism has a softer edge to it. The concept of friendship describes equalism at its best, but friendship is specific and local: we need a term that can be a more general principle. Have others made this point already? Other thinking on equalism compared links this discussion to many more. Let us know what you think – click on contact. Help us to keep improving this website. Forgive us as we keep editing the articles. This is a huge diverse topic. The blog itself is a format for greater equalism. For now we are too limited to match this big vision. We need others to help make that happen. In time contributions from all quarters may help reveal the picture in the jigsaw we’ve started work on here. John Burnham (2011) Developments in Social GGRRRAAACCEEESSS: visible-invisible and voiced-unvoiced. Chap 7, pp 139-160 In Culture and Reflexivity in Systemic Psychotherapy: Mutual Perspectives. Inga-Britt Krause (ed). Karnac: London (with permission). The fair-test cartoon above was redrawn with permission from an original on the website of the NDP Gender and Equality Unit, Department of Justice and Reform, Republic of Ireland. Those who work in equalities have worked a lot of this out before. The cartoon is used here with permission from Karen Richardson (as she was then), author of Oxfam’s gender training manual: See Both sides: A practical guide to gender analysis for quality service delivery. Thank you – very interesting! I’m studying for a doctorate in clinical psychology interview. Equalism and Equality… slightly confusing but yet I see the power. I wonder if the negative connotations of ism get carried over to “equalism” however? I.e. treating all black people like white people in spite of clear white privilege. Not sure. Could you clarify, im interested? Thanks for your comment and feedback. There is no doubt that this field is confusing. You are kind not to find our weblog confusing too! We have done our best to define our terms so that fairness – “fairism” doesn’t quite work, does it? – means respect for difference, not everyone being the same. A recent addition may be of relevance – the fun TV programme exploring the paradox of Norway’s top rating with equalities, yet its still unequal distribution of jobs by gender. The possible conclusion is that when you achieve fully “equalist” cultures, then people can most freely choose what they like, and that means the differences still show up. Women tend to like people jobs; men tend to like thing jobs. But the difference is not so great that men absolutely can’t do women’s work, and women can’t do men’s work. Equalism – and maybe democracy etc – mean we put a lot of work into supporting diversity and freedom of choice even though the outcome looks the same as under more oppressive systems! I’ve expanded my thoughts on it in the Feminism, patriarchy blog. Thanks for your reply! :) Really helpful. 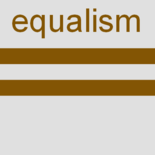 This entry was posted on 28 June 2013 by Nick Child in Equalism in general, issues & 'ism's, uncategorised and tagged Equalism.